Full-spectrum lighting is vital for a captive bird's health. Most pet birds originate from the tropics, where days are long and natural light is readily available. Your bird can develop health problems if he does not have adequate exposure to full-spectrum light each day. You can supplement this need artificially if your environment does not provide enough natural light. Full-spectrum light can't be obtained by turning on a table lamp. It's the light emitted by natural sunlight that provides vitamin D to animals and humans. Full-spectrum light provided by nature delivers ultraviolet light. A component of this gives vitamin D -- essential to the health of birds. Birds need a full day's worth, or 10 to 12 hours, of this light daily. Vitamin D aids birds, humans and some other animals in the absorption of other nutrients. Humans can absorb vitamin D through their eyes. Birds can too, but they absorb it differently and in a wider spectrum. A bird's eye can absorb ultraviolet light, while a human eye filters it out. Birds also emit oil from a gland over their tails that spreads when the birds groom. This oil produces vitamin D when exposed to the ultraviolet rays of full-spectrum light. A bird who does not get enough light fails to produce the vitamin D he needs to keep him healthy. It can cause stress leading to behavioral issues, such as pulling at his feathers, biting or excessive squawking. He may become depressed or lethargic. Lack of full-spectrum light can also affect organ development and calcium levels, create poor feather growth and immune deficiencies. 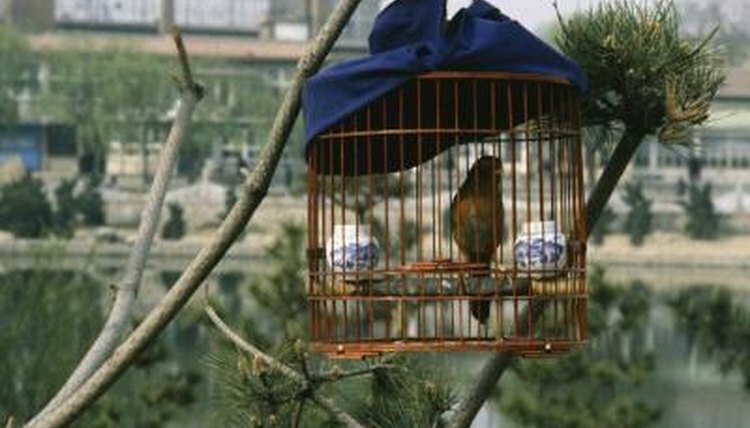 Even if your bird's cage is in front of a window, it may not provide enough full-spectrum light to meet his needs. Most window glass filters out UV rays. Provide additional full-spectrum light by using a light that provides both UV and UVA rays. Purchase light bulbs made for birds, not for plants or fish. Place the light 12 to 18 inches from the bird's cage. Leave the light on for four to eight hours each day for the most benefit. During the overnight hours, cover the bird's cage to provide darkness.